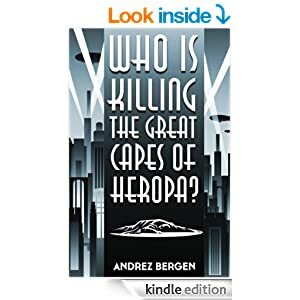 Who is Killing the Great Capes of Heropa is a fantastically different and entertaining novel. Set in a dystopian post apocalyptic future where there is only one city left on earth. Therefore is it any wonder that the oppressed citizens of this city seek escape within a virtual world? Our hero, who is just fifteen, lives alone his parents long ago dragged off by the fascist police. He ekes out a meagre existence by scavenging for food. It's on one of these food hunts that he discovers a hoard of ancient comics. From that moment on he is hooked. Later, his knowledge of comic books will lead to him securing a place in a virtual world that is quite unlike any other. As with any virtual realm there are defined rules. Andrez Bergen is clear in outlining these: No swearing and no drinking among others. Breaking these will result in our player being kicked from Heropa with a two-day penalty. I'm no reader of comics. I grew up reading the classic sci-fi novels so just about all of the author's carefully crafted references and in jokes probably flew right over my balding head. However, I enjoyed the witty comic book banter, which was always effective, and it was great to read a book with no swearing in for a change! In my own fiction there's foul language on almost every page. What I enjoyed most about this novel is the interplay between the characters. Humour is very much the backbone of this Chandler style who dunnit. Our hero, Southern Cross, attempts to find out who is killing the great capes of Heropa. It’s not a perfect world and relationships are flawed, things start to go wrong in the game with sometimes comic and even sinister consequences. Bergen has created a spectacular world here and I could easily see it running to a series of novels, comics and spin offs. Interesting artwork enriches the kindle edition I read. A very different read that I enjoyed from page one until the conclusion. The author has researched his subject painstakingly and meticulously and the novel flows like warm butter from a pan. A well deserved five stars from me.